Die flämische Komponistin Annelies Van Parys (*1975) gehört in ihrer Heimat zu den interessantesten Vertreterinnen der postspektralen Generation. 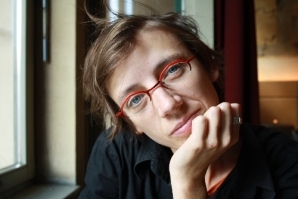 The Flemish composer Annelies Van Parys (*1975) is, in her homeland, one of the most interesting representatives of the post-spectral generation. “This performance reflects the big talent of Annelies...who, as few other composers in Flanders, masters the art of limitation and has no fear for beauty and seduction"
Annelies Van Parys (°1975) studied composition at the University College Ghent, Royal Conservatory, with Luc Brewaeys. She has received many prizes including the Laureate from the Royal Flemish Academy of Belgium in 2011. Her works were featured in the opening concert of the ISCM World Music Days 2012 and throughout the festival and her works have already been selected for the WMD 2014. Increasingly in demand across Europe, Annelies Van Parys is performed at major festival and venues and by many major Ensembles and orchestras, in Belgium and abroad. She has frequently cooperated with Muziektheater Transparant and the Asko|Schoenberg Ensemble. For these partners she premiered, to great acclaim, her “An Oresteïa” and in 2012 her chamber music arrangement of “Pelléas et Mélisande” was premiered by Oxalys. Annelies Van Parys is a Jury member for 2Agosto, Gaudeamus Muzik Week and Tactus and teaches formal analysis and orchestration at the Royal Conservatory of Brussels. She is Honorary Ambassador 2011 for the Ghent Conservatory.